The kids love the comfort and their parents love the classic style. In just a few years, Mole – Little Norway has become a must-have for stylish children all over the world. Before 2011, people used to ask Hanne Synnøve Koløy where she bought clothes for her children. Her answer was that she had knitted them herself. Now however, nobody is wondering any more. In just a few years, her unique knitted clothes with signature pattern have already become classics. ​The designer finds inspiration in her own children, the beauty of nature, the Norwegian heritage and history. The collections are timeless yet playful and combine comfort and distinctive designs. Like many other artists, Hanne was privileged to have creative role models around. Her beloved mother and grandmothers were always handcrafting and remaking garments for the little ones as they grew up. The brand name «Mole» was the cozy nickname her grandmother Serina called Hanne when she was a little girl – and it became so natural to name the brand after her. To Hanne, the name holds many memories about comfort, love and kindness. 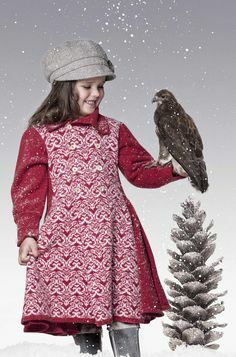 See more collections from Mole-Little Norway.